Here’s something rather epic! 20th Century Fox Home Entertainment have just sent us this brand new and exclusive trailer / sizzlet for the Star Wars Blu-ray box set which is released 12th September. The twist here though is that it contains a never before seen deleted scenes from Star Wars! This shows just a tiny snippet of new footage that we can expect to see on the 40+ hours of extras. This trailer has been released to coincide nicely with Comic Con 2011 where Twentieth Century Fox have a very special Star Wars Rebel Experience to promote the Blu-ray which you can pre-order here. IGN have done a great write-up of the experience together with images right here. It looks like they have a full size C3PO and R2D2 to welcome you into the experience. If you’re at Comic Con, we highly recommend going along. The Star Wars Blu-ray box set is something that we cannot wait to see and we know millions of Star Wars fans are going to love it too. Now, without further ado, the trailer! Check out this amazing trailer in all its glory below. We also got a press release through yesterday informing us that fans who pre-order the movie will also be entitled to their very own Limited Edition Star Wars® film cell. The limited edition Star Wars Sentiype™ contains a unique 35mm film frame reproduced from the original film footage using state-of-the-art imaging and printing techniques. The film frame is mounted and features original artwork from the Star Wars Blu-ray collection. Each senitype™ is numbered for authenticity. 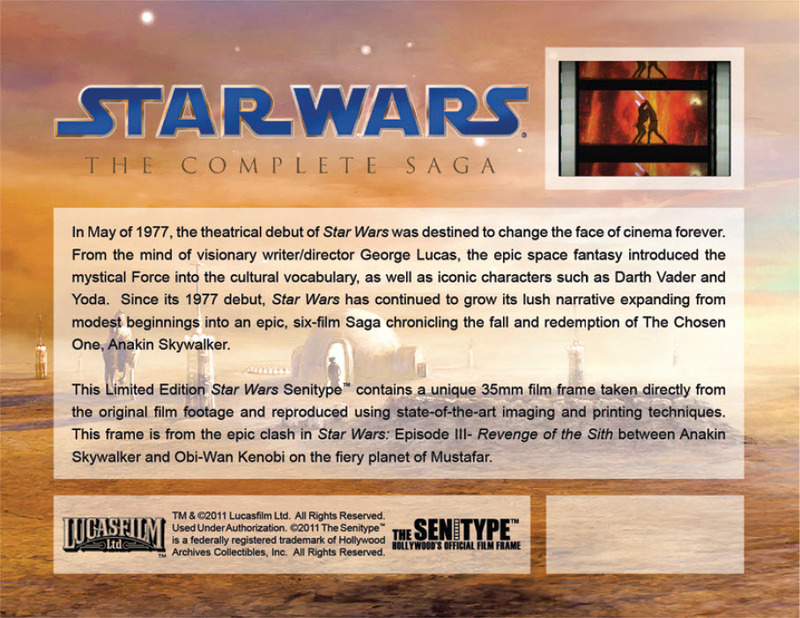 The Senitype is only available to those that Pre-Order The Complete Saga on Blu-ray. One limited edition Star Wars Senitype™ will be sent to all persons that have already pre-ordered The Complete Saga on Blu-ray.